Even after $5 million dollars worth of improvements a few years ago, the Russian River County Sanitation District (RRCSD) treatment system does not function properly during high flows. The system has violated its discharge permit every year since the Sonoma County Water Agency (SCWA) took over in 1995. A year ago, the District was fined $99,000 out of a possible $170,000 for permit violations occurring between Oct. 1, 2004 and May 31, 2007, consisting of 34 effluent limit violations and six prohibited discharges. Wastewater discharged into local streams by sewage treatment plants is subjected to lengthy and complex State permit requirements that can run as much as a 100 pages long. The permits include directions on water quality limits, monitoring, receiving water standards, and protections of beneficial uses, among other things. They describe when and where discharges can occur and penalties to be imposed when compliance fails. As treatment systems age, and pipeline replacement lags, the opportunities for failure (and fines) increase. The Regional Water Quality Control Board is charged with overseeing this very complex process. The name of the park, Steelhead Beach, conjures up visions of fishermen crowding the beaches in anticipation of their catch. 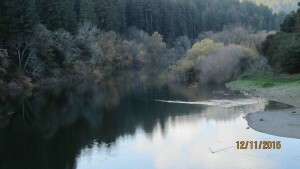 Steelhead runs were legend on the Russian River and are all but gone now. And so are most of the fishermen. No longer do you see the river crowded with men (and some women) in hip boots, throwing their long lines into the running waters, hoping to snag a beautiful fish that they knew were just waiting for them. Fish stories were abundant prior to the 1990’s at King’s Bait and Tackle, and Pat’s Restaurant nearby. But times have changed. Santa Rosa’s river discharge plans just keep coming…..
Santa Rosa has come a long way since we first started tracking their wastewater discharge plans after the 800 million gallon sewage spill in 1985, 23 years ago. For about twelve years after that illegal dump, they ignored all pleas to diversify their system, increase conservation, repair leaky collection pipes, and greatly cut back on river discharges. Instead, they pursued numerous river discharge options that would allow them to greatly increase their dumping of treated sewage into the Russian River. On Thursday, April 3, 2008, about 75 people attended the City of Santa Rosa’s only hearing on their direct river discharge project-environmental impact report (EIR). About 25 people spoke. Since the document is over 5000 pages and highly complex, most pleaded with City officials to expand the public comment period by 30 days and to hold another hearing closer to the end of the comment period.